Bal-Sagoth 1993 demo will be officially released by Godreah Records with bonus tracks in September 2013 under the title “Apocryphal Tales – Demo 1993“. In 1993, Bal-Sagoth recorded their original demo in an archaic subterranean studio, during the depths of winter. The tracks were raw, barbaric and primal black-death metal. The demo was never officially released, because the band went directly on to record their debut album for Cacophonous Records shortly thereafter. Now, to mark the 20th anniversary of those original recordings, the demo shall finally be released on CD (limited to 500 copies) and vinyl! Featuring the tracks as they were originally recorded, plus some exclusive bonus material from the archival vaults, as well as full lyrics and new sleeve-notes by Bal-Sagoth vocalist/lyricist Byron Roberts, this long awaited release is a fascinating glimpse into Bal-Sagoth’s mysterious and primal past, and is sure to enthrall fans both new and old alike. 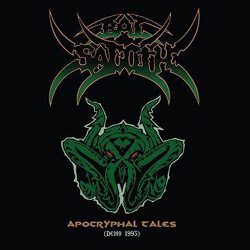 Behold… Bal-Sagoth’s “Apocryphal Tales“.